Children learn more 'by being kids' than from school worksheets. School is back and the homework battle is about to begin. But before the first meltdown know this - most primary-aged Kiwi kids only do 15 minutes a night and experts believe there are better ways to learn than endless worksheets. A survey of 160 Kiwi mums and dads found most parents are happy with the amount of homework sent home from school. Among the 98 parents who thought the amount was spot-on was Dunedin mum Amanda Martinez. Martinez did not want her 6-year-old son Ezra, 6, doing more than 20 minutes a night. The Sacred Heart pupil had set reading, spelling and maths each night, which he usually completed without complaint. Mrs Martinez said she preferred harder maths sums to be done at school. "The work they do at home should be something they are confident to do independently," she said. "Harder multiplication and maths problems need to be done at school with their teacher." Out of 160 respondents to the unscientific Herald on Sunday survey, 111 said their child did up to 30 minutes of homework each night, 29 did up to an hour and 12 parents said their children hit the books for more than two hours every night. 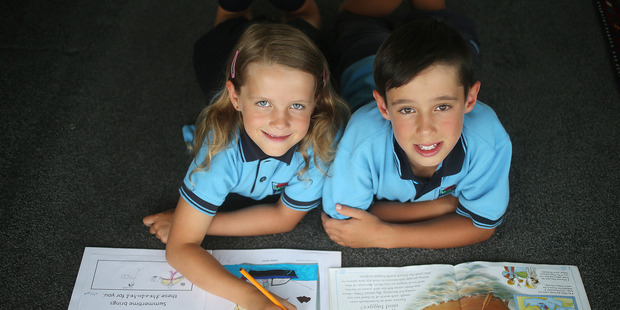 Waikato University professor of English Language Education Terry Locke said studying for more than 20 minutes was a waste of time and that children learned "by being kids". Reading and spelling got full marks from Locke but he said worksheets and time-consuming projects were meaningless. "I cannot emphasise how important reading at home is," Locke said. "Read together and get them to read to you. Write together, go for walks and enjoy daylight savings - let your children enjoy their childhood." Locke said children learned when they were engaged with parents, when they played games and helped with cooking and activities. "We tend to equate education with what happens inside the classroom but since the start of the human race learning is something that happens anywhere," Locke said. He describes worksheets as "meaningless busywork." Auckland mum-of-two Audrey Henderson said reading was the main focus with her children Dylan, 8, and Lucy, 6. The children did up to 20 minutes homework each night, plus extra reading. "Dylan goes to bed at 7pm and he is allowed to read until 8pm. He loves reading," Henderson said. The Henderson children also help their father Chris with odd jobs around the home. "They love helping and I definitely think they are learning new skills when they help," Mrs Henderson said. "It's definitely not all about homework." One mother said her privately schooled child was expected to complete the usual reading, spelling and maths but also had detailed weekly assignments. "It is very time consuming and I often wonder what he is getting out of it," she said. "Some of it is quite difficult so it is more like the parent is doing the homework." The Ministry of Education leaves homework policy to individual schools and said some set homework across ages and some don't set any. Lisa Rodgers, head of early learning and student achievement, said homework was valuable as it gave parents a way to be involved in their child's learning. "Talking with their children about the learning, rather than merely supervising, is particularly effective," Rodgers said. She said homework needed to be kept positive, otherwise it could do more harm than good. "Where homework becomes an area of conflict between a parent and a child, it ends up having a negative effect on learning," she said.